HomeFor ClientsAnalyticsForex Analysis & ForecastsForex Technical analysis and forecastsForex Technical Analysis 2011/02/15. EUR/USD, GBP/USD, NZD/USD, AUD/USD Forecast FX. Forex Technical Analysis 2011/02/15. EUR/USD, GBP/USD, NZD/USD, AUD/USD Forecast FX. As it is seen from the eurusd analysis the EUR/USD currency pair has reached all the targets of the short-term descending pattern. 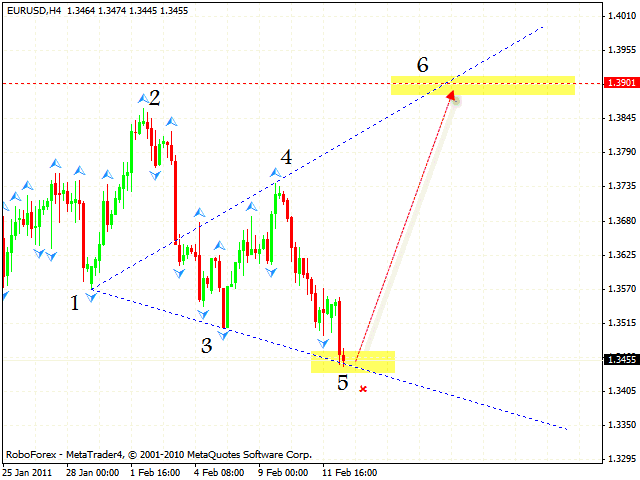 At the moment we can see the formation of the rising Wolfe Wave with the target in the area of 1.3900. The price is testing the area where we can buy the pair. 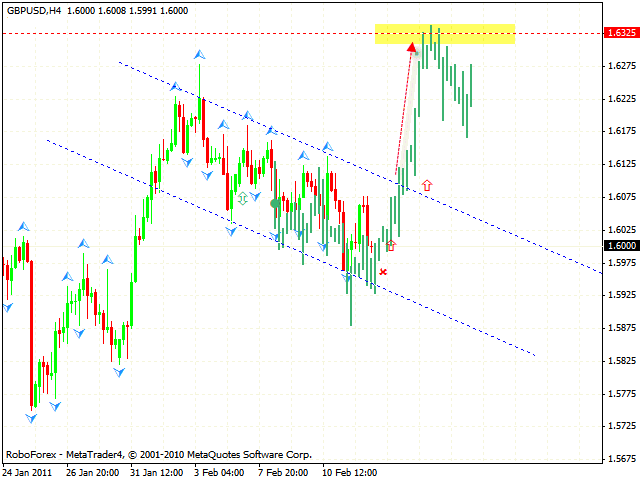 One can try to open long positions with the tight stop below 1.3405. 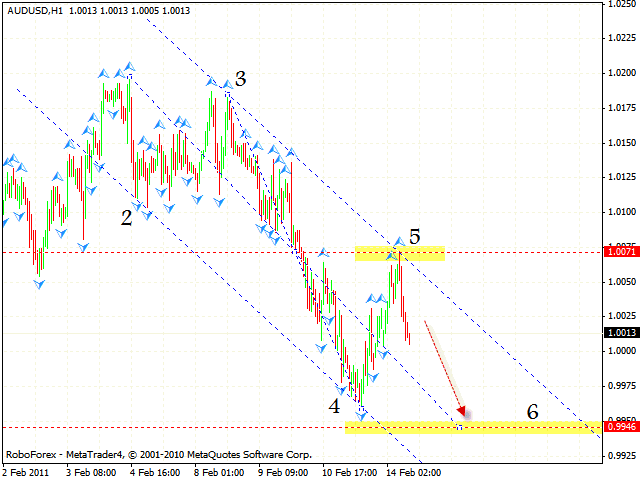 Pound keeps moving inside the descending channel, and there is still some potential for the pair to grow. According to the gbpusd analysis “Head & shoulders” forex online reversal pattern may be formed, and one can consider buying the GBP/USD currency pair with the stop below 1.5970. One should increase the amount of long positions only after the price moves above the channel’s upper border. New Zealand Dollar hasn’t been corrected at all. 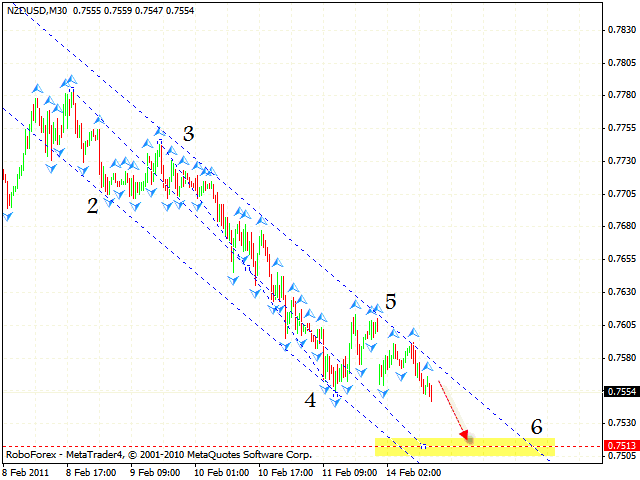 Currently we should expect the price to reach the target in the area of 0.7513. One can consider the tight stop sales of the pair. On the basis of the nzdusd forecast the pair may grow from the defined area, but if the price breaks the channel upwards we recommend you to close short positions. As it can be seen from the aud usd analysis Australian Dollar has reached the targets when forming the 5th point of reference, and now is moving inside the descending pattern to the main target in the area of 0.9946. At the moment we should expect the pair to fall even lower. However, if the price breaks the channel’s upper border, one can open long positions.